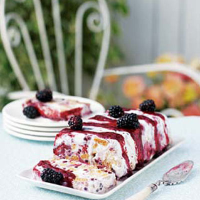 Vanilla ice cream is marbled with blackberries, crushed lemon biscuits and a fruit coulis in this simple but stunning dessert. Line a 900g loaf tin with cling film, leaving enough hanging over the edges to fold across the top of the parfait once the tin is full. Place the sugar in a saucepan with 4 tablespoons of cold water and bring to the boil. When the sugar has dissolved, stir in the mint. Reserve a few blackberries for decoration, then add half the remaining berries to the pan and simmer for 3-4 minutes until they have softened. Remove from the heat and cool slightly, then blend in a food processor before sieving to make a smooth coulis. Meanwhile, place the ice cream in a large bowl to soften slightly, but do not allow to melt. Roughly chop the remaining blackberries and add to the ice cream. Mix together with a fork, then stir in the biscuits and half of the blackberry and mint coulis until you have a marbled mixture. Reserve the remaining coulis. Spoon the mixture into the loaf tin, folding the cling film over the top. Freeze for 4-5 hours or until firm. Remove from the freezer 10-15 minutes before serving. Turn out onto a plate, remove the cling film and drizzle with a little of the remaining coulis. Decorate with the reserved blackberries then slice and serve with any remaining coulis. For variations to this recipe, replace 2 tablespoons of the water with 2 tablespoons of cassis (blackcurrant liqueur), or the biscuits with crumbled meringue, or the blackberries with blueberries. in hot water for a couple of seconds to loosen slightly. Serve with a glass of light and fruity dessert wine.